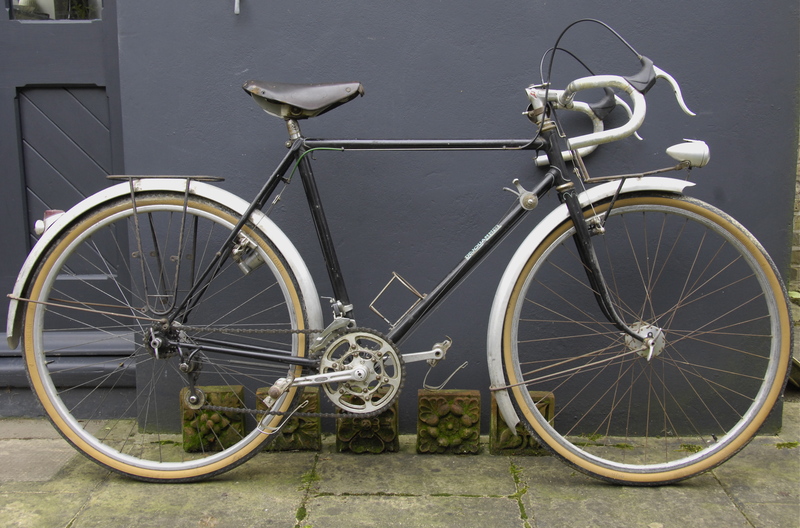 A recent purchase was a Marcel Dejouannet touring bicycle in very original condition. It’s a fairly straightforward job to clean up and preserve this bicycle, but I thought that it would illustrate well some of the techniques I use, and some of the thought processes involved. This series will feature ‘before and after’ photographs of various parts of the bicycle, and a definitive guide on how to shellac handlebar tape. I bought the bike because it was a fine example of a rare maker of considerable quality. Dejouannet made bicycles up until the late 1980’s, the company being founded by Martial Dejouannet in Paris in the 1940’s. Later, working with his son Marcel he moved to Bressuire in the mid-West of France. As part of the process of restoration I have been researching the maker. Little is known of them so I am digging further and am now in touch with his family, who are kindly providing some history and photographs of Monsieur Dejouannet, which will be published here in the near future. This machine is light, indicating a top quality tubeset such as Reynolds 531 or top level Vitus. It is fitted with classic high-end duralumin touring parts – Stronglight chainset, Maxi-CAR hubs, Pivo alloy rims, Lefol mudguards, Bell wing nuts, Philippe bars and stem, Mafac brakes, Cyclo 4-speed gear. 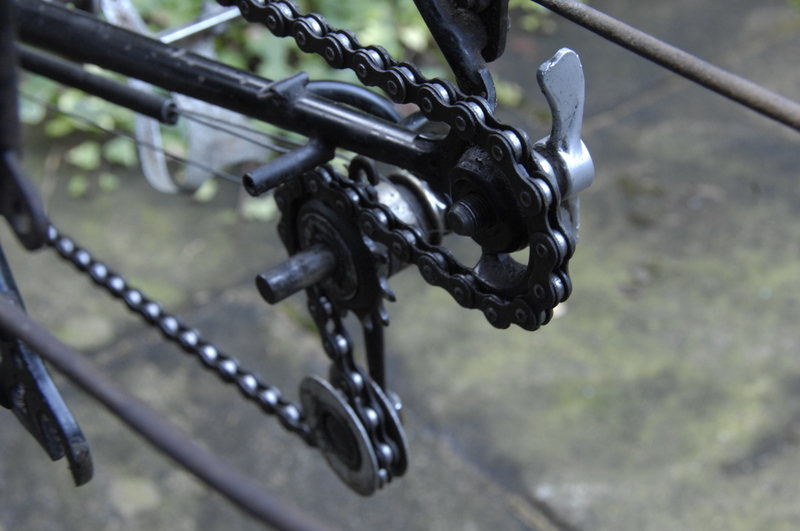 Additionally there are other nice features such as the ‘constructeur’ built front and rear racks, internal dynamo wiring, annular bearing bottom bracket, and a Nivex-style rear dropout which enables rear wheel removal without touching the chain: When removing the wheel you shift the chain over onto the chain rest, which is integral with the dropout, then unscrew the drive side wing nut which is permanently fixed to a short piece of axle, and is also captive in a special fitting. When you release the left hand wing nut, the wheel drops straight out with ease, and without getting greasy hands! You can read further about my approach to restoration here and here. I never rush into working on a bicycle. You need to sit and look at it for some time, contemplating what to do, before starting to pull it to pieces. I find that a good beer helps in this process. Then I take extensive photographs to record every aspect of the bike for future reference, and to aid re-assembly. 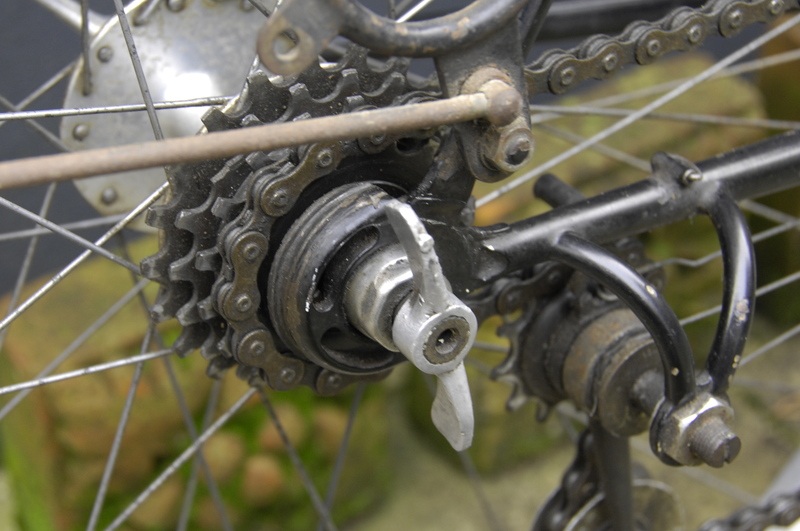 The next part of the preservation process is to try and date the bicycle and assess to what extent the parts on it are original. 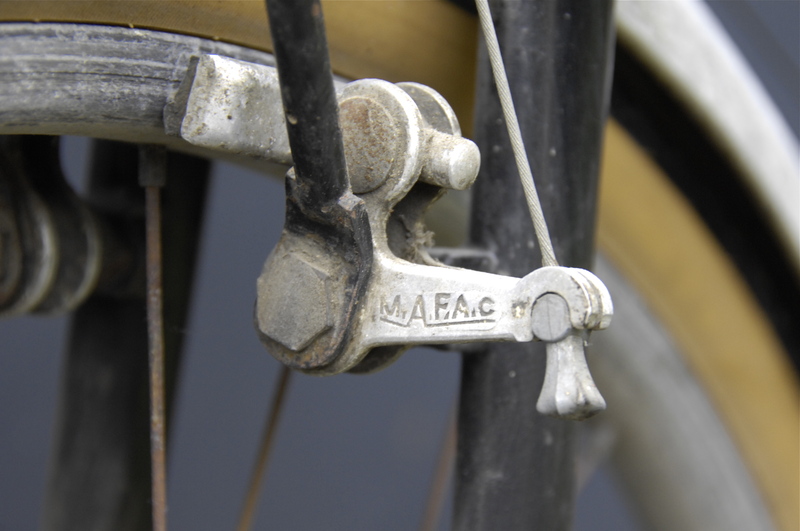 A few indicators are noticeable: The Mafac brakes are the early type with ‘m.a.f.a.c.’ stamped on them. The full stops between the letters denote 1950’s production. Similarly, the second pattern Maxi-CAR hubs indicate 1950’s. The overall style of the bike together with the parts fitted indicate a date of early 1950’s, during the golden age of French touring bicycles. Internet research to find pictures and information about similar machines is also useful. In this case it threw up little information about the maker, and few photographs of machines except for much later ones. The excellent Forum Tonton Velo is generally very useful for information on French bicycles, although it is almost exclusively in French. If you are interested in French bikes then you should learn some French anyway! However, this is the version where the cable pulls from above, whilst this bike was fitted with a pull from below version. 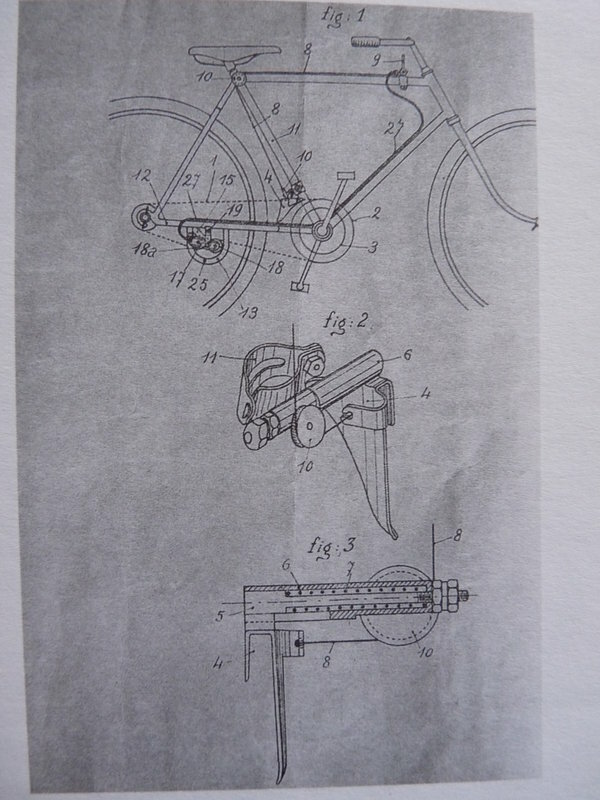 After more digging Dutch collector and connoisseur of French bicycles, Rob Van Driel, very kindly provided me with photographs and dimensions of his Le Chat FD, fitted to his Alcyon randonneuse, complete with dimensions of all the parts. Information sharing like this is so important in this process, and I am indebted to him. So, I am now in a position to have a go at making a replacement. The horrible brake hoods are very clearly modern replacements so they can simply be cut off and thrown away. The Mafac levers would have either had no rubbers at all, or been fitted with rubber half-hoods. The enamel paintwork is generally in good condition except for on the racks. They may warrant some careful re-painting but this will be kept to a minimum. 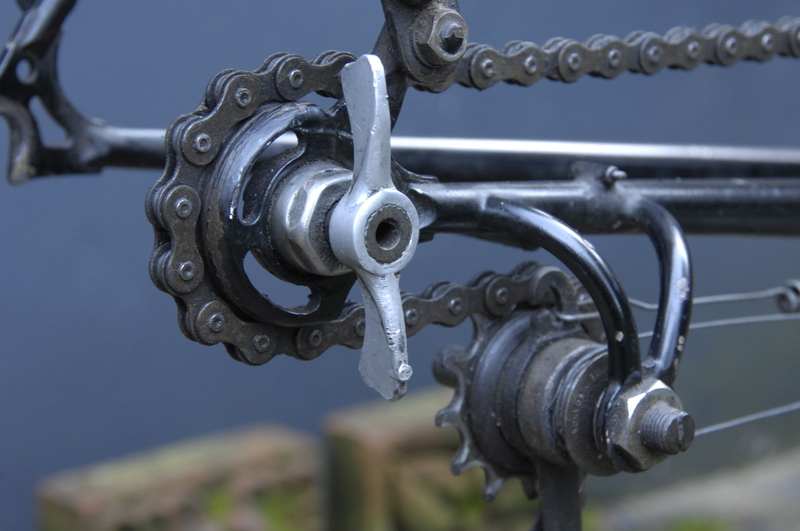 At the end of the ‘contemplation’ process, I decided that this bicycle should be kept as original as possible, carefully cleaned, with some very minor touching in of paintwork only, replacement of non original brake cable outers, and replacement of the front derailleur. 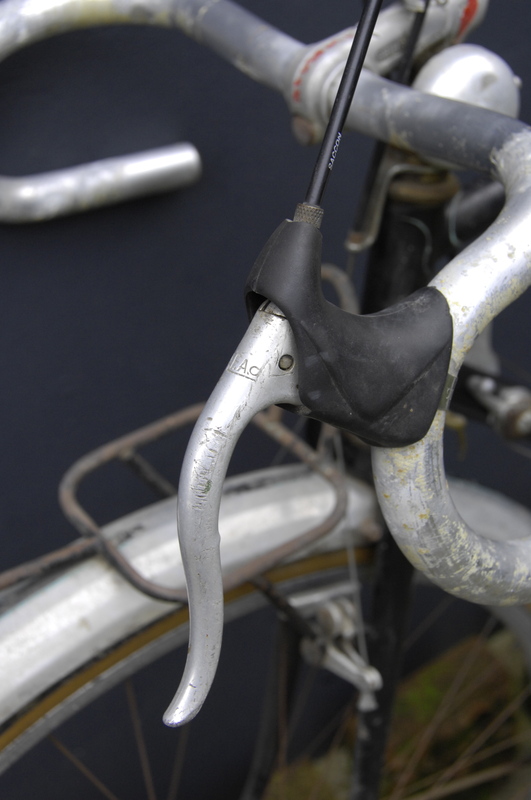 The bicycle will be serviced, including rebuilding of the stiff Stronglight headset and replacement of brake rubbers. Tyres will be replaced.